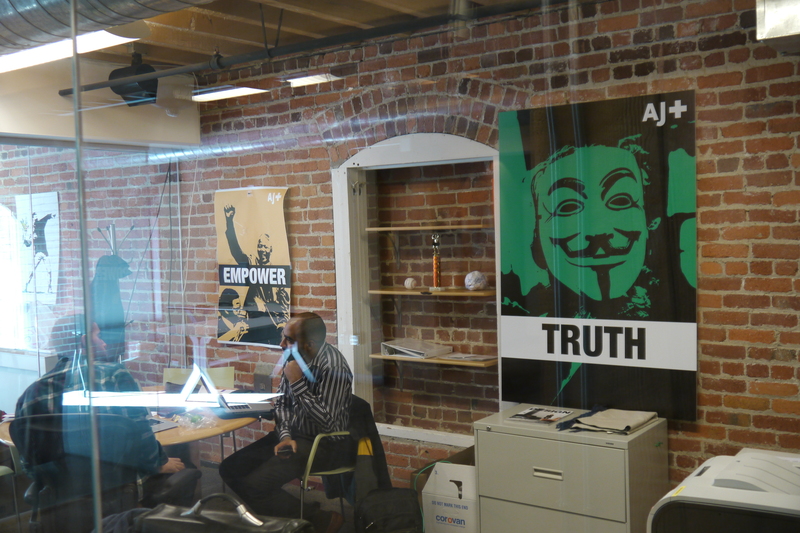 Across from San Francisco’s AT&T (s T) Park stadium, a small group of news junkies is working on building a different kind of startup. The first thing you notice when entering their building is the omnipresent imagery of civil rights leaders and pop culture icons from around the world. Nelson Mandela, John Lennon and Aung San Suu Kyi are everywhere, as are promises of defiance and empowerment. But the building, which formerly housed Al Gore’s Current TV, isn’t home to some kind of progressive nonprofit. Instead, it’s the birth place of AJ+, Al Jazeera’s ambitious attempt to produce news for an audience that gets its information from the internet. Omnipresent civili rights imagery: a picture of the AJ+ newsroom. Al Jazeera first announced its plans to launch an internet news network at an industry conference in October, and the Qatar-based news organization is set to officially unveil the AJ+ brand with a placeholder website in the next few weeks. But in San Francisco, the team of AJ+ is already busy working on producing pilots to meet its goal of a soft launch early next year. AJ+ executives invited me to take an exclusive behind-the-scenes look this week, and while they didn’t share too many details about the shows and news formats that they’re working on, they weren’t shy about telling me what they don’t want to do: television. “You don’t want to inherit the legacy of the TV,” said Al Jazeera Media Network’s Executive Director of Strategy, Development and Technology Yaser Bishr. He argued that previously, news networks simply tried to repurpose TV content online, or positioned their online presences as a kind of supplemental offering; something where viewers go if they want to learn more about what they’ve seen on TV. With AJ+, there is no TV. The online network is completely separate from Al Jazeera America, the recently-launched cable channel, or other Al Jazeera TV networks, he said. AJ+ may use Al Jazeera’s resources, including its 82 bureaus around the world for its reporting, but the goal is to produce different content that speaks to a different audience. 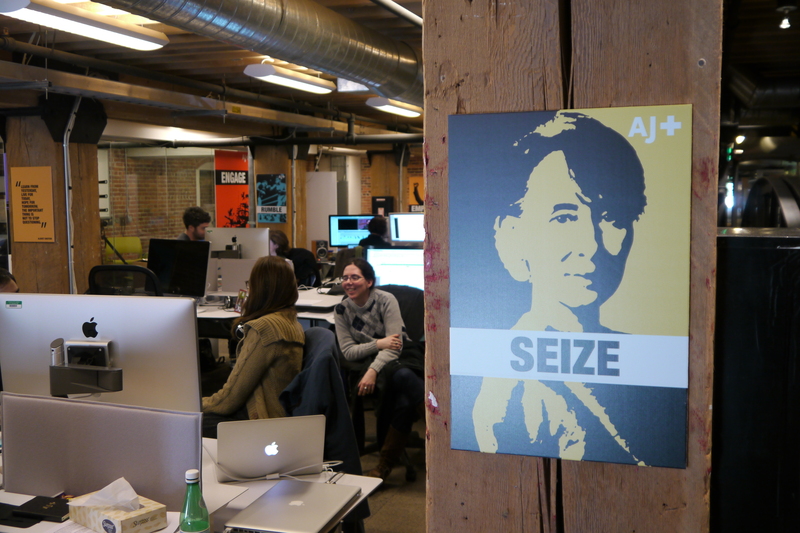 A studio in progress: AJ+ is getting ready for a soft launch early next year. That’s why the network chose AJ+ as its name, as opposed to just calling it Al Jazeera online, and that’s also why it’s launch team in San Francisco, away from both the corporate headquarters in Qatar’s capital Doha and Al Jazeera America’s headquarters in New York. Bishr called the level of independence a “shell of protection” that’s supposed to allow AJ+ to do things differently. For AJ+ Launch Director Riyaad Minty, this also meant to rethink some internal processes. Minty previously helped Al Jazeera to launch some of its cable properties, and that process typically started with a programming grid. For an online network, that just didn’t seem appropriate. “We threw the grid out,” Minty told me. Gone is also the role of a news anchor, and live reporting will play a much smaller role for AJ+. Most programming will instead be made available on demand, through platforms like YouTube, mobile and other connected devices. “We are going to be where the audiences are,” said Al Jazeera Media Network’s Head of New Media and Incubation Moeed Ahmad. 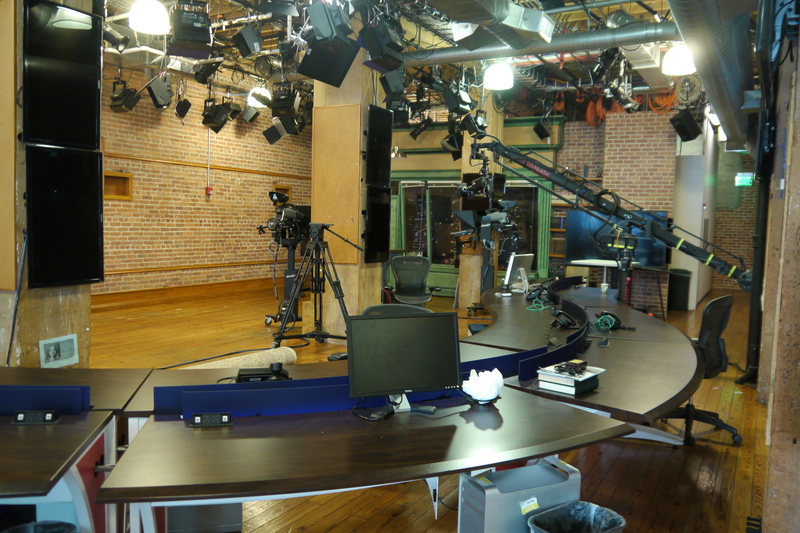 AJ+ got its studio through the acquisition of Current TV earlier this year, but is now upgrading the space. Al Jazeera was first toying with the idea of an all-digital network in 2010. “Then, the Arab Spring happened,” quipped Minty. That kept everyone busy, as Al Jazeera’s on-the-ground coverage turned the network into a go-to news source for reporting from the region. Much of that audience came to Al Jazeera through the online live stream of its Al Jazeera English network, in part because most U.S. cable providers refused to carry Al Jazeera English. Al Jazeera bought its way onto U.S. cable boxes with the purchase of Current TV earlier this year, which led to the foundation of Al Jazeera America. 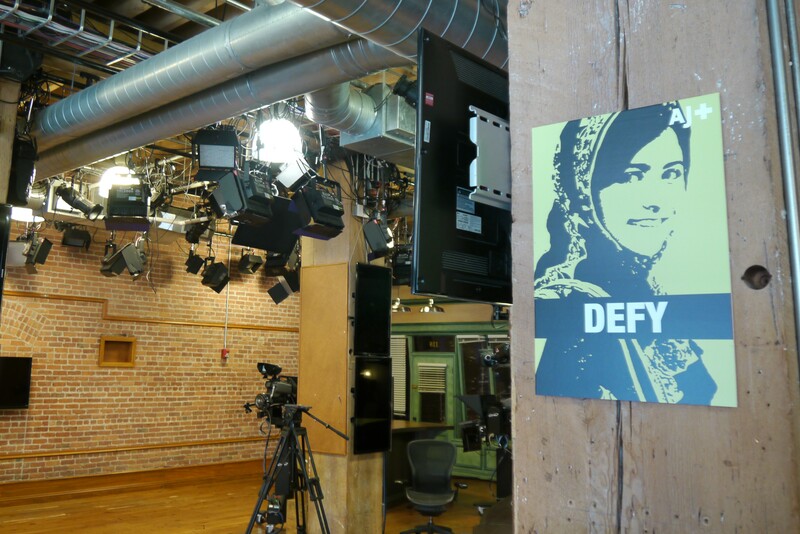 However, those distribution agreements forced Al Jazeera English to block access to its live stream as well as its news videos on YouTube, resulting in protests from cord cutters and Al Jazeera producers alike. Al Jazeera America has been slow to catch up with U.S. audiences; recent reports put the network’s number of daily viewers at 13,000. However, even established news networks aren’t watched by millions. CNN attracted some 174,000 viewers each day during the same time, while MSNBC had 121,000. Politically-charged Fox News led the pack with a daily audience of 353,000. Minty doesn’t watch Al Jazeera America, or any of its competitors, because he doesn’t have cable. He believes that the audience of AJ+ isn’t tuning into traditional network news either. Instead, they get their news from social networks, curated by their peers. “People trust people more than they trust organizations,” he said. 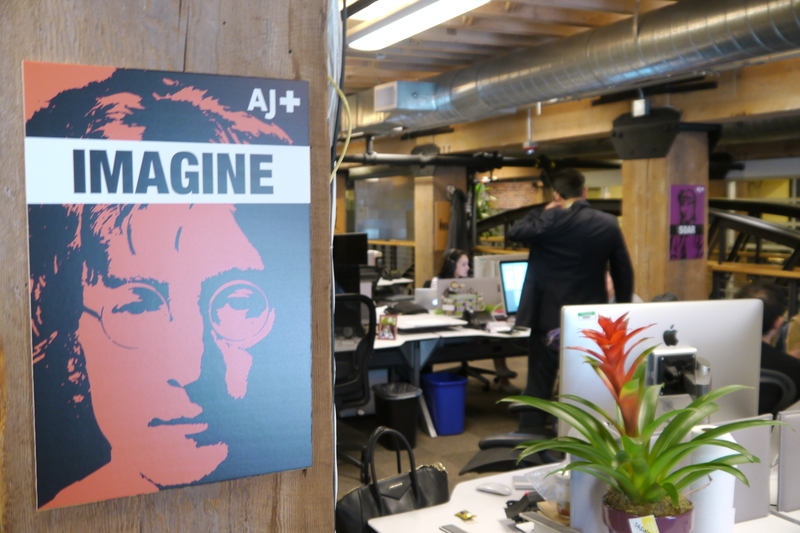 AJ+ wants to speak to that audience through videos that emphasize sharing and interaction. “At the end of the day, we want to be in people’s social streams,” said Bishr. The network wants to start off with news coverage from around the world, and also cover verticals like lifestyle, culture and technology. Videos could range from one minute to an hour, but there will be very little text on the AJ+ website. “People like to watch news, not read news,” Bishr said. Minty added that AJ+ is still experimenting with story-telling formats, and that these experiments will continue even after the launch. “We are not scared to fail and make mistakes,” he said. All of this may sound heavy on startup-y vision statements and light on details, and previous experience has shown that ambition alone isn’t enough to capture online audiences, especially when it comes to something as fleeting as news. Case in point: YouTube gave Reuters a sizable advance to produce original programming for its ReutersTV channel, but didn’t renew the contracts when audiences failed to materialize. However, Bishr made it clear that AJ+ is more than just a buzzword-heavy online experiment. “This is very serious to Al Jazeera,” he told me, adding that AJ+ represents Al Jazeera’s biggest investment into digital to date. And the online network’s plans are clearly ambitious: Soon after the soft launch early next year, AJ+ will get a second office and in Doha. An AJ+ Arabic offspring is set to go online next summer, followed by dedicated Turkish programming soon after. Aljazeera America is killing me. I used to be an AJ addict but now i am left with CNN, Press TV or RT. And, they all remind me of the Aljazeera Glory times. I have already lost any interest in Aljazeera and was it worth half a billion???? it really is annoying !!!!! Well, I wasn’t impressed with Al Jazeera America. It was just regular network TV news “hop scotching the world for headlines” as John Cameron Swayze use to say on the Camel News Caravan. (I’ll bet none of you know what I am referring to without looking it up on the internet.) I will check out AJ+ but it better have some cojones and not be a shill for the United States or Doha. As someone in the US who fell in love with AJE and objected vehemently to losing it’s feed upon the birth of AJAM I remain very interested in any available AJ offerings. I am curious about what journalistic ethics will provide structural underpinnings for AJ+ content and presentation. I am typically of an audience that prefers news girded by historical context and analysis that gives it meaning and perspective, so I am not sure whether AJ+’s elimination of text and anchor presentations will provide the kind of in depth news I value most. “People trust people more than organizations” implies that the people we encounter in browsing social media are in fact trustworthy when hard experience should tell us that they are not. In fact, You Tube is full of nastiness and all kinds of mendacity by the people who leave comments and that is also true of all of the other social media platforms. What is needed from online news organizations is concerted effort to raise the tone of online discourse. I love the idea, but HATE the name. AJ+ is so unoriginal. It obviously sounds like Google+ and we know how great of a success that’s been. Sorry but it sounds like someone who doesn’t really understand or use new media named the organization and that worries me. So, CNN and MSNBC are not “politically-charged”? I’m not sure why that needs to be added to a piece about a news network and their daily viewership. In this context, I added it because what Fox News is doing is obviously working for them.